Worm gears on both axes provide smooth, easy motion when tracking targets. Plus, you’ll find slip clutches in both axes for quick and easy pointing. A sturdy aluminum tripod anchors Omni AZ and stabilizes your images. Your Omni AZ comes together in just minutes with a simple, no-tool setup. Omni AZ is the ideal telescope for day-to-night observations. A dual-position arm can be raked back for pointing higher in the sky, or adjusted to point downward for viewing objects at or below the horizon. Perfect for balconies, high windows, and observation decks, Omni provides stunning views of wildlife, landscapes, and more. Plus, its beautiful design makes it a showpiece in any room. Celestron’s Omni family has always been synonymous with bright, clear views. You’ll find the same high quality optical components in our new AZ telescopes. All optical surfaces on the Omni XLT AZ 102 are fully coated with XLT optical coatings. This proprietary technology—found on our observatory-grade telescopes—ensures maximum light transmission and Omni’s signature crisp views. The 102 mm refractor provides enough light-gathering ability to view all the best celestial objects in the solar system and beyond. The telescope’s wide field of view allows you to appreciate extended objects such as the Pleiades Star Cluster, Andromeda Galaxy, or simply panning the Milky Way. Some telescopes can invert or flip your subjects, but Omni XLT AZ 102 includes erect image optics for correctly oriented images. 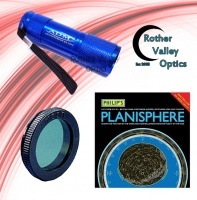 Your Omni AZ telescope also includes a high-quality 25 mm Plossl eyepiece. From a perching shorebird to a distant galaxy, zero in on your subject quickly and accurately with our all-new StarPointer Pro reticle finderscope. Instead of a red dot, which can obscure your target, StarPointer Pro projects a dual circle reticle. Place your subject in the center of the circles, and you’re ready to view it with your Omni AZ telescope. It’s that easy. New Omni manual slow-motion altazimuth mount uses worm gears for smooth, easy tracking of celestial or terrestrial targets and slip clutches for quick and easy pointing. Quality optical components are fully coated using Celestron’s proprietary XLT coatings—the same ones found on our observatory-grade telescopes. 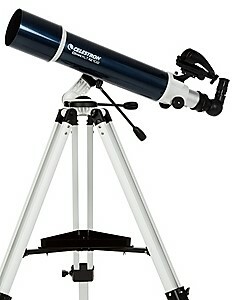 Refractor offers a large 102 mm aperture and wide fields of view for both astronomical and terrestrial viewing. The mount’s single arm can be repositioned to point near the zenith for astronomical use or downward for terrestrial observing from a deck or window. Premium StarPointer Pro finderscope projects a dual-circle reticle instead of a simple red dot.